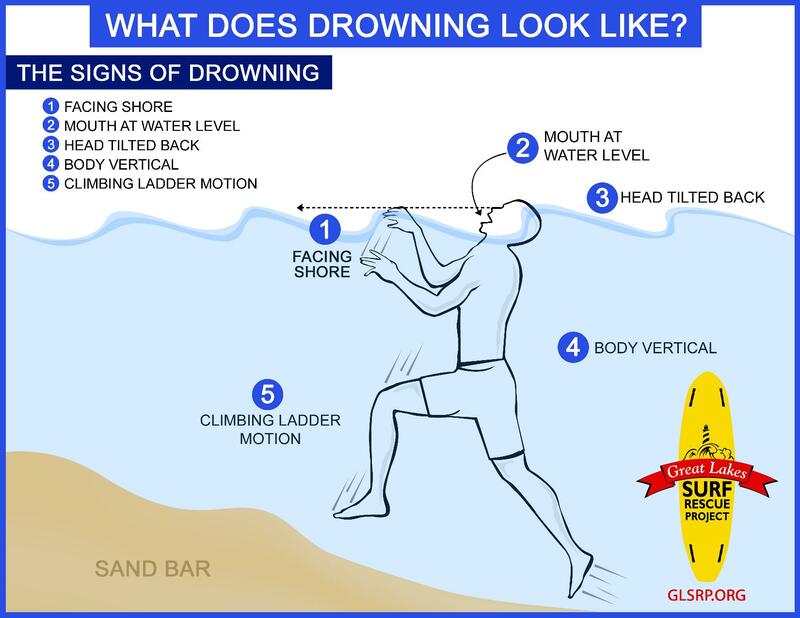 Great Lakes, USA – The Great Lakes Surf Rescue Project (GLSRP) is proud to announce that its “Signs of Drowning” illustration has been requested for use in a Summer Safety Stand-down briefing for Soldiers in Germany. “This is a fantastic display to educate people on the signs of drowning,” said SGT John Hampton, Safety NCO at the U.S. Army Health Clinic Wiesbaden, Clay Kaserne, Wiesbaden, Germany. 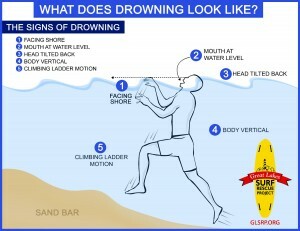 A swimmer in distress that starts displaying the Signs of Drowning may reach final submersion within 15 to 45 seconds. At two minutes of submersion, a drowning victim has a 92% survival rate if recovered and CPR and artificial respiration is performed properly. Consider if you are in the water at the beach and witness a drowning submersion – how long would it take you to get out of the water, get to a phone, call 911, identify your location, 911 dispatch first responders to your location, and recover the victim? Would it already be past the ten minute mark? Would it already be a recovery mission? Note: survival rates may vary due to age, health, water temperature, and other varying factors. HISTORY – The Signs of Drowning, also known as the Instinctive Drowning Response was created by Francesco A. Pia, Ph.D. It’s what people do to avoid actual or perceived suffocation in the water. And it does not look like most people expect. Unfortunately Hollywood has taught us what drowning doesn’t look like. With actual drowning there is very little splashing, no waving, and no yelling or calls for help of any kind. Vertical in water. Not using legs for forward swimming movement. Ladder climbing motion, rarely out of the water. In case you find yourself drowning/doing the signs of drowning, STOP IT and FLOAT.